I have only made fondue a handful of times since Chad got me a fondue maker for Valentine’s Day a couple of years ago, but so far this Caramelized Shallot Gruyere Fondue is my favorite. Shallots are caramelized with a bit of sugar and salt, then mixed with dry white wine and gruyere cheese. The mixture is seasoned with nutmeg, garlic, apple brandy, and freshly ground black pepper before serving. I used this fondue pot (Cuisinart CFO-1000 Lazy Susan Electric Fondue Maker ) to keep the cheese bubbly and melty, but it is not required. If you have a tabletop burner, you can cook everything at the table and turn the heat to low to serve. If all else fails, just eat the cheese quickly before the fondue cools and begins to thicken (before getting a fondue maker, I may or may not have eaten over the stove a time or two). 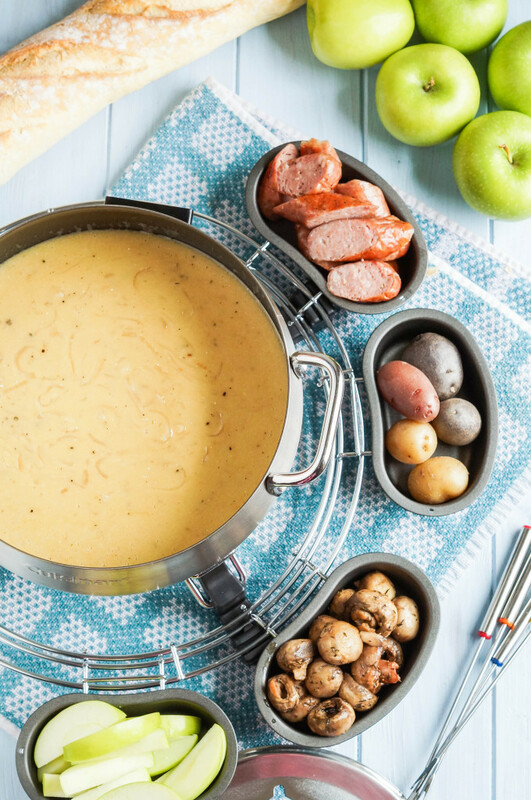 Pair the fondue with your favorite dippers. Some ideas include: marinated whole mushrooms, fingerling or other small potatoes, sliced apples, grilled sausage, bread, broccoli, brussels sprouts, pretzels, or asparagus. Make sure to grate the cheese, not shred it, to help make a smooth sauce. If the ending mixture is too thick, add in a little more wine or water. I enjoyed the leftovers as a spread on slices of bread. 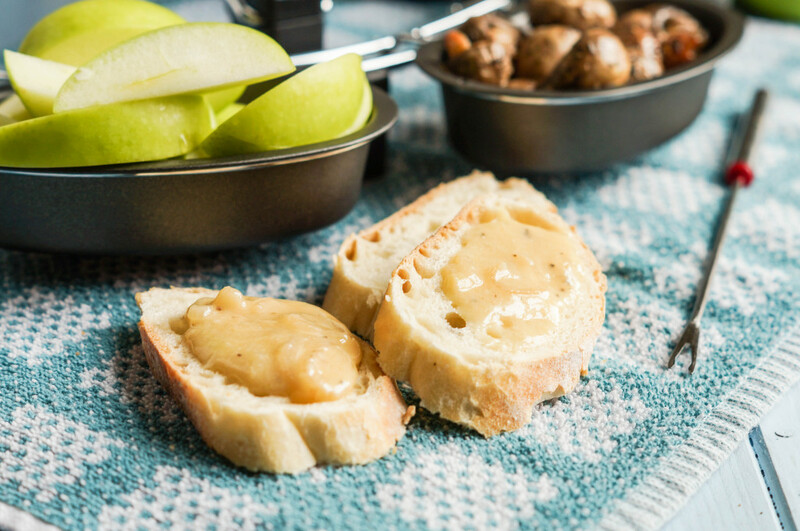 You can even stick the covered bread slices until the broiler briefly to make it bubbly in a Welsh Rarebit-style. 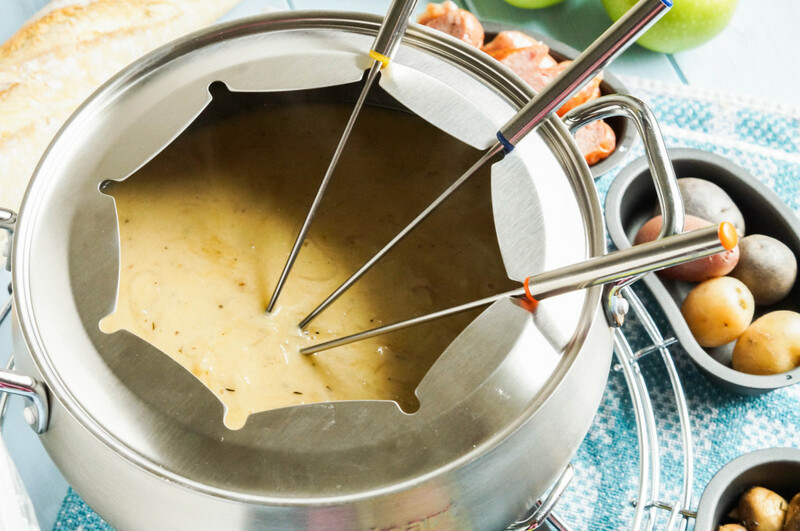 To make the fondue gluten-free, use 1 1/2 tablespoons cornstarch instead of the flour. In a large saucepan, melt the butter over medium heat. Stir in the sliced shallots and cook for a couple of minutes before stirring in the sugar and salt. Reduce heat to medium low. Cook, stirring occasionally, until golden brown and softened, about 15 minutes. Place the grated cheese in a large bowl and toss with the flour. Pour the white wine over the caramelized shallots and increase heat to bring to a boil. Cook for a minute, then whisk in a small handful of cheese until completely melted and smooth. Once the mixture comes back to a boil, whisk in another handful of cheese. Continue, allowing the mixture to boil before each addition, until all the cheese is incorporated. Stir in the nutmeg, garlic, apple brandy, and a generous amount of black pepper. Season as needed. If desired, transfer mixture to fondue pot to keep warm and bubbly. I think this will be my fondue this Valentine’s! Incredible photos, too. I haven’t mastered the art of cheesy photography. Thanks! It was definitely interesting having to carry everything upstairs.